"The ill-Fated Beauty 薄幸的美人 (bō xìng dè měi rén)"
An extremely beautiful woman with smarts and capability, Zhen Ji was Cao Pi 曹丕's first wife. The word 姬 is a title for "lady". Thus her real name is not Zhen Ji, but rather Zhen Luo 甄洛. Her life was a down-hill rollercoaster of misfortune and victimization. She lost her father at the age of 2, was married to Yuan Shao 袁绍's son Yuan Xi 袁熙, but was forcefully remarried to Cao Pi after he became obsessed with her beauty. After giving birth to Cao Rui 曹睿, she fell out of favor with Cao Pi due to rumours and bad-mouthing from his concubine, Guo Nu Wang 郭女王. Zhen Ji never did manage to win back Cao Pi's favor. Instead, the bad-mouthing from Guo Nu Wang became worse. Zhen Ji paid the ultimate price when Cao Pi, poisoned by Guo Nu Wang's words, forced Zhen Ji to commit suicide. 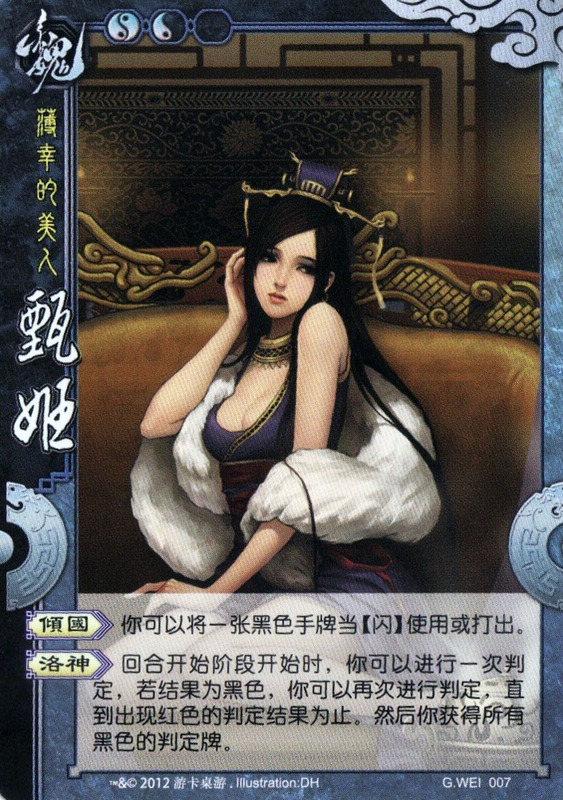 Character ability 1: "Stunning Beauty 倾国 (qīng guó)"
You can use or play a black on-hand card as DODGE. 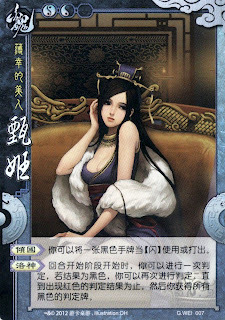 Character ability 2: "Goddess Luo 洛神 (luò shén)"
At your beginning of your turn, you can flip a judgement card. If the result is black-suited, you can flip another judgement card, until a red-suited judgement results. After that, you acquire all the black judgement cards. “Goddess Luo” has been changed. You cannot acquire the black cards until the whole process is done. This is to prevent the bug if a player picks Lady Zhen and Sima Yi as a pair. "Impetus to war" is not linked to the story. Though we know that Cao Pi peeled her from Yuan Xi, she was not the reason Cao Cao destroyed Yuan Shao and family. This ability is probably centered around game mechanics than history. "Goddess Luo" stems from a poem written by Cao Zhi 曹植, Cao Pi's brother, known as "Goddess of the Luo River 洛水之神", apparently praising the goddess for her ethereal beauty, intelligence and capability. It is rumoured that Cao Zhi had an affair with Zhen Ji. “倾国” (lit. ruin the kingdom) was used to describe the beauty of Lady Zhen. Orginally used to describe the beauty of a concubine of Han Emperor, it was said that Lady Zhen’s beauty outmatched jade and flower, and her beauty could ruin the whole kingdom (玉肌花貌，有倾国之色). When Lady Zhen was about to be killed by Cao Pi, her beauty stunned Cao Pi, and Cao Pi snatched her instead of killing her. The game mechanism allows Lady Zhen to use her beauty to stun her attacker, thus prevent being “killed”.